If you missed my National League preview, check it out here. Comments/Fantasy predictions: Aaron Judge wins the MVP award, while Gary Sanchez “wins” fantasy MVP, separating himself from the rest of his position with a big bounce-back season … Gleyber Torres finishes as a top-three fantasy second baseman, while Troy Tulowitzki is surprisingly useful to owners over the first half of the season … Masahiro Tanaka is the Yankees’ most valuable fantasy starter, while Domingo German has a breakout campaign and goes down as one of the best late round steals. New York’s dominant bullpen is tough to beat in October. The leader in saves in Boston’s pen isn’t currently on the team’s roster, while there isn’t a cheaper 20/15 threat at draft tables than Jackie Bradley Jr … J.D. Martinez leads all of baseball in RBI, while Rafael Devers’ price tag will never be cheaper than now … Chris Sale and David Price both fail to reach 160.0 innings pitched, but Nathan Eovaldi, Eduardo Rodriguez and Rick Porcello more than make up for it and are three of the most profitable fantasy SPs of 2019. Austin Meadows has a nice future, but Kevin Kiermaier produces more fantasy value this season at a cost 100+ picks later, while Diego Castillo becomes one of the biggest waiver wire adds of the year, as he’s a top-five closer after the All-Star break … Charlie Morton and Tyler Glasnow are big wins for fantasy owners who draft them, as Tropicana Field remains a great place to pitch. Vladimir Guerrero Jr. doesn’t debut until May 1 but wins Rookie of the Year unanimously anyway, as he enters next season as a consensus first round fantasy pick … Justin Smoak is a top-12 fantasy 1B, while Randal Grichuk hits 35 homers with 90 RBI … Dylan Bundy continues to disappoint, while Jonathan Villar goes 20/40 (it’s crazy how deep middle infield has become) … Baltimore has the league’s worst run differential, but Mychal Givens pitches well and keeps the closer’s job all season, making him one of the best draft day bargains for saves. Comments/Fantasy predictions: Cleveland has a loaded staff but a few holes (particularly in the outfield) for a team that’s such a heavy favorite to win its division … Jake Bauers is a fantasy sleeper, while Shane Bieber finishes as a top-25 fantasy starter. Byron Buxton, who had a -3 wRC+ last year, is a bust yet again, while Nelson Cruz is too discounted at drafts thanks to his DH role (and age), as he produces another .275-35-100 season … Miguel Sano hits like a top-10 third baseman once he returns, while Michael Pineda makes a triumphant comeback and is a top-30 fantasy starter … Jose Berrios goes berserk and wins the Cy Young award, as the Twins are my favorite long shot bet in the American League this season (I got them at 60/1 to win the World Series). At minimum, Minnesota should benefit from beating up on the weaker teams at the bottom of their division. Eloy Jimenez finishes runner-up in the ROY race, but the White Sox have a rough pitching staff, with Michael Kopech’s recovery from Tommy John surgery arguably the most important aspect of the team’s season … I’ve decided not to recommend Lucas Giolito to fantasy owners again this year … Billy Hamilton leads MLB in steals, while Jorge Soler goes down as a bargain at draft tables … Jacob Junis, whose ADP is outside 240, finishes with more fantasy value than Sonny Gray, Jon Gray and Jon Lester … Adalberto Mondesi hits less than .240 and steals fewer than 40 bases, while last year’s second half goes down as Ryan O’Hearn’s best stretch of his career. 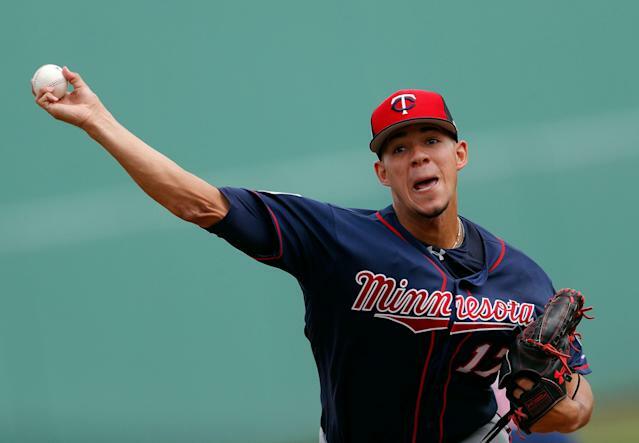 Joe Jimenez quickly replaces Shane Greene and finishes as a top-10 fantasy closer, while Matthew Boyd is a top-50 starter at a cost nowhere near that … Miguel Cabrera rebounds and proves he’s not finished yet with a big comeback season. 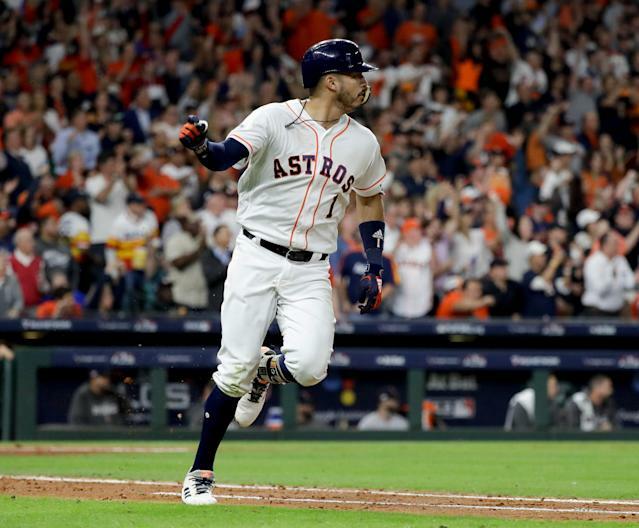 Comments/Fantasy predictions: Carlos Correa is a dark horse MVP candidate who’s available in rounds four or five in fantasy drafts, but it’s Houston’s impressive pitching depth that really separates them … Collin McHugh and Brad Peacock go down as draft day thievery, while Forrest Whitley and Josh James also make big impacts after the All-Star break … I grabbed Gerrit Cole at 25/1 to lead the AL in wins, and few if any setup relievers have more upside than Ryan Pressly. Justin Bour hits 30 homers, while Zack Cozart clubs 20 … Shohei Ohtani also makes a big impact over the final five months, as Angels Stadium played as an extreme HR park for LHB last season after the team lowered the right field fences ... Albert Pujols’ -1.9 WAR over the last two years ranks last in MLB, and it’s too bad Andrew Heany is injured, as he was emerging as a borderline ace … Rookie Ty Buttrey is a sleeper for saves in the Angels’ pen, while Tyler Skaggs greatly outperforms his ADP. Matt Olson needs to be buried on draft sheets after undergoing hamate bone surgery, and Jurickson Profar fails to live up to expectations while making a dramatic switch in home parks ... Ramon Laureano also disappoints while hitting in the .230s, and Blake Treinen isn’t a top-five fantasy reliever … One year after prized prospect A.J. Puk had to undergo Tommy John surgery, A’s fans have to be thinking they’re cursed with news of Jesus Luzardo being shut down with a strained rotator cuff … Khris Davis, whose increased his home run total during all seven years he’s been in the league, hits exactly .247 for the fifth straight season. Rougned Odor goes 30/20 and is a top-five fantasy second baseman, while Asdrubal Cabrera is an even bigger steal at middle infield. Over the last three seasons, the parks with the biggest increase in run scoring are (park factor): 1. Coors Field (133) 2. Rangers Ballpark (124) 3. Tied (110). In other words, there’s a big gap between the second-best hitting park in baseball (Texas) and the third best. Delino DeShields Jr. steals more bases than Mookie Betts, while Joey Gallo leads MLB in home runs. Gallo was first in Barrel% last season with 22.5. Second-best was Khris Davis (and Max Muncy!) at a distant 16.9 … Mallex Smith and Dee Gordon steal a lot of bases, while Yusei Kikuchi finishes as a top-30 fantasy starter … Edwin Encarnacion and Hunter Strickland are both traded at the deadline, with Shawn Armstrong effectively taking over as closer in the second half.